I recently photographed this full rainbow in the back yard--and if you look closely, you can see a faint double rainbow hovering above it. 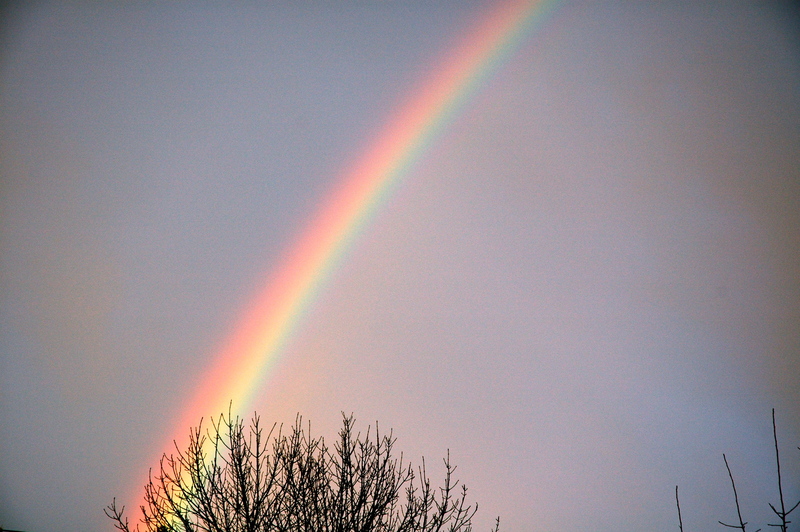 I still remember the first time I saw a full rainbow, just like the ones in picture books. I was 15, and my family had traveled from New Jersey to Washington state to house hunt. I loved the place, its impressive row of windows and its proximity to the water. I loved what would have been my bedroom. I even loved the local school after visiting for a day. But living there would have meant moving all the way across the country from everything I had ever known. On that trip, my parents and I were driving in the car when one of us spotted a full rainbow out the window. I can’t remember who saw it first, but I remember pressing my nose to the glass and feeling this unbelievable sense of joy. A whole rainbow! 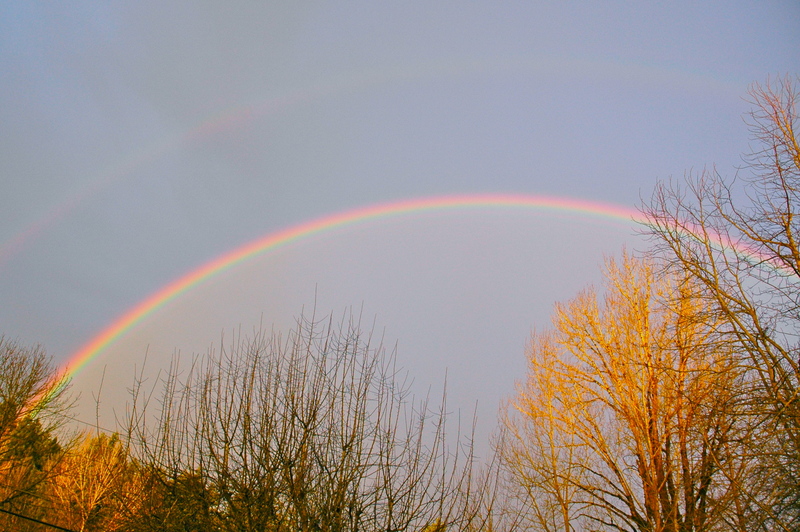 Even seeing a portion of a rainbow was rare where I grew up; they are a lot more frequent here in the Pacific Northwest. Like many little girls, I had doodled countless rainbows on countless pieces of scrap paper during my childhood. And I had long ago memorized ROY G BIV, the order of the colors. Until that moment in the car, though, I had never seen more than a portion of an arc, and even that was pretty rare in New Jersey. It felt absolutely magical to see a full rainbow for the first time. We didn’t move to Washington. But I ended up in the Pacific Northwest nearly 10 years later, and I’ve been here ever since. It’s a land of full rainbows. And it’s still magical every single time I see a full one. I still think about that house sometimes. The life I would have led as a teenager in Washington state. The friends I would have made in that lovely little school. I wonder if that early delicious taste of the Northwest is part of why I fell in love with Oregon so readily. There are many moments like that in fiction, where the road forks and the character chooses one route over the other (or is forced one way or the other). That’s one of the reasons I write: to explore paths I’ll never take in my own life. To find out what kind of gold lies on the other side of the fictive journey. This entry was posted in Fiction, Writing and tagged Laura Stanfill, Northwest, rainbow, writer. Bookmark the permalink. I love rainbows, too. Even though I’d trade the beach, palm trees, or sunshine for rainbows anyday. We saw a beautiful rainbow last week and I actually brought the kids outside to look. They were amazed. Fun post! What a magical childhood memory, Emma!